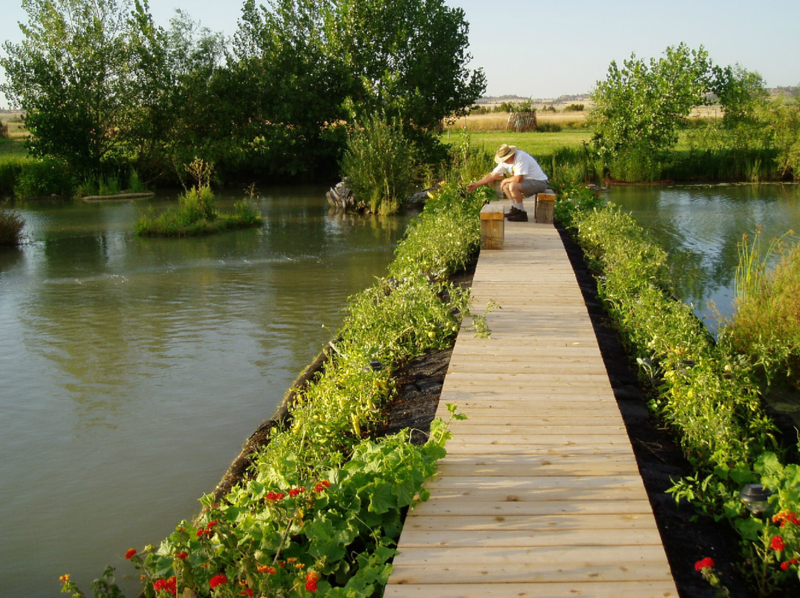 Floating Islands , a type of wetland, provide a “green” approach to water system maintenance and eliminate the need for chemicals that damage the natural order of an aquatic ecosystem. They also provide fantastic habitat for fish, offering shade and habitat for juvenile fish. Floating Islands are ready to withstand the elements and can tolerate thick ice, with no need to remove for the winter. They can be used in a range of watercourses ranging from small ornamental ponds or streams to ponds that cover several acres. Our floating islands range from 2ft to 15ft in diameter and use natural shapes to better mimic natural systems. Biodocks are a variation of floating island technology incorporates a boardwalk on top of floating islands. ​They are engineered to support a range of human activities including fishing access, gardens, gazeboes, picnic tables, and boat docks. They provide the advantages of any conventional dock, with the added benefits of water quality improvement, habitat diversity, water elevation adaptability, while beautifully blending in with the natural shoreline. The price range of the islands will vary from $25-$35 a square foot, planted and installed. This provides an alternative to traditional constructed shoreline technology and requires virtually no maintenance. 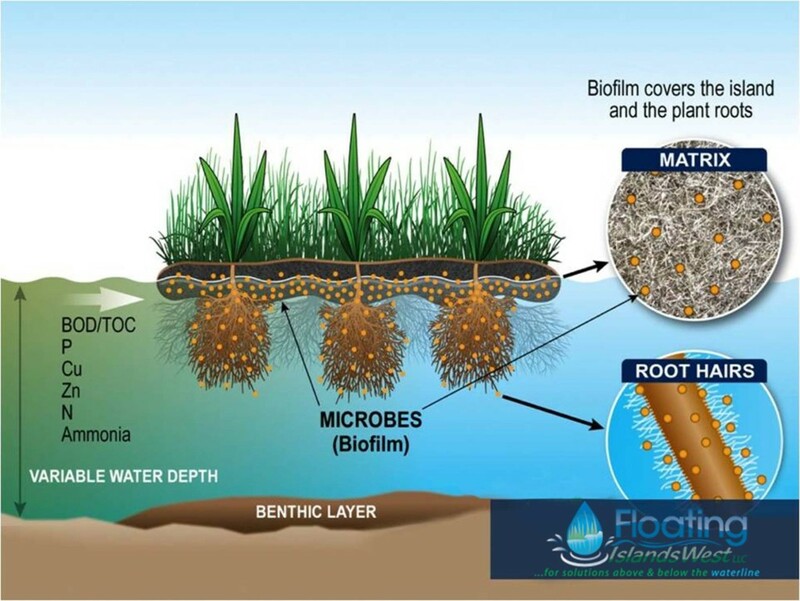 The addition of floating wetland habitat represents biomimicry at its best, cleaning polluted water and naturally restoring the balance to a more optimal level. Floating islands schematic from our friends at Floating Islands International. Colter installing a young floating island on a 12 year old project near Hyalite Creek, Montana. A Biodock in action. A fantastic addition to floating islands. `Our longtime friend and collaborator Bruce Kania gave a TED Talk about Transition Water and the role that floating islands will play in getting there by using nature as a model. Check it out. A graduate of the University of Wisconsin-Madison, Bruce has focused his professional career on product invention, intellectual property development and licensing since 1992. After enjoying success in the fields of prosthetics, textiles and sensor technology, his life-long fascination with the interrelation of natural and human systems, combined with his passion for the outdoors, led him to conceive the idea for what eventually became the technology behind the BioHaven brand of floating treatment wetlands. Today, Bruce is CEO and Research Director of Floating Island International, Inc., and is the Chairman of the FII Board, as well as being the principal owner of Fountainhead, LLC, FIIs parent company. 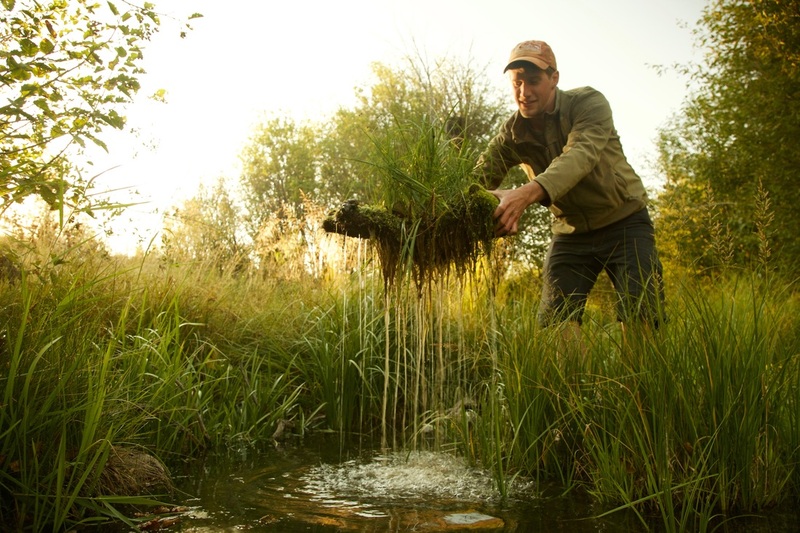 He remains actively involved in licensing, demonstration projects and promotion, while pursuing his quest for holistic and effective solutions to nutrient-impaired waters, working with Nature through the practice of biomimicry.